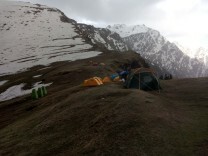 This 6-day trek to Sar Pass takes you to the rough and mountainous interiors of Himachal Pradesh. Trekking through forest wilderness, you will camp at some of the most picturesque campsites in the Indian Himalayas. En route, you will trek on narrow nature trails that will lead you along towering mountains layered with dense forests of conifer and pine. As you gain altitude and get closer to the Sar Pass, the gorgeous landscape views begin to include patches of thick snow. Stop at vantage points along the way and catch breathtaking views of snow-capped mountain peaks. With a few steep slopes and uphill climbs, this is a moderately difficult trek that is ideal only for fit beginners and experienced trekkers. Please note that a minimum of 2 travellers are required to book this trek. Located at an altitude of 13,800 feet, the Sar Pass is a popular trekking destination among trekking enthusiasts for the gorgeous views of a varied landscape. This trip begins as you trek uphill from Kasol and pass through dense forests spread over gigantic mountains. As you reach closer to the Sar Pass, the forests and trails begin featuring patches of thick snow that entirely change the landscape. In the local dialect, 'Sar' translates to lake, a reference to the frozen lake that trekkers need to cross just before reaching Sar Pass. • Stay in tents pitched at sunning campsites. 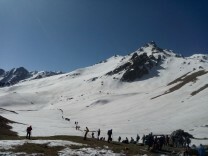 • Trek uphill to an altitude of 13,800 feet to reach Sar Pass. • Catch views of the entire Parvati Valley from the Sar Pass top. Travellers are required to adhere to instructions of the trek leader during the trek to Sar Pass. 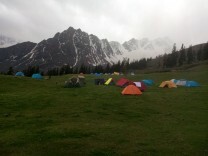 For cancellations made more than 3 days prior to departure of the Sar Pass trek: 30% refund. 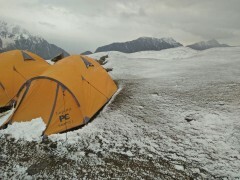 For cancellations made 0-3 days prior to departure of the Sar Pass trek: No refund. The tour operator reserves the right to cancel or alter the itinerary of the trek to Sar Pass to maximize the safety of travellers as well as staff. 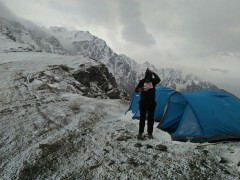 Kasol Campsite by 09:00 hrs. Kasol Campsite by 16:00 hrs. Arrive at the base camp in Kasol by morning. Here, you will meet the rest of your group and attend a short orientation session with your tour guide. 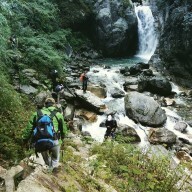 This session will acquaint you with the process of rucksack packing, marching/walking techniques and general awareness about the trekking route. After the orientation session, embark on a short acclimatization walk around the base camp in the evening. You will return back to the campsite by night. 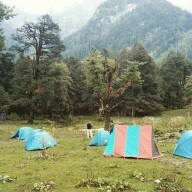 Overnight at Kasol in tents. Board vehicles that will drive you to a short distance towards Kasol city. You will continue the rest of the journey on foot. Begin trekking on a nature trail, often frequented by local shepherds, and trek through dense forests of pine trees to reach the Grahan village. The trail will get increasingly rocky and steep as you reach closer to Grahan. You will reach the village by evening. Overnight at Grahan in tents. Make your way to Min Thatch on a narrow nature trail that gives you spectacular views of Min Thatch, Nagaru and Sar top in the mountains. The trail gets increasingly steep and thick forests begin dominating the landscape. Once you cross the final stretch, you will reach Min Thatch and catch amazing views of you'll reach Min Thatch. From here admire the Chanderkhani mountains. Overnight at Min Thatch in tents. Today's journey takes you to Nagaru. The initial part of your trek will take you through a pastoral forest with frequent patches of snow. As you keep gaining altitude, the snow gets thicker and the trail gets steeper. You will reach the campsite in Nagaru in a few hours. With the evening sunset, you will also catch the city lights of Manikaran on the horizon. Overnight at Nagaru in tents. Trekkers exploring around the campsite. Today you will finally trek to the Sar Pass. The longest trek of your trip, begin climbing a trail that overlooks the Tosh Valley. When you reach the Sar Pass, spend some time admiring exhilarating mountain views. Begin descending from the pass and cross a few river streams before reaching Biskeri Thatch. You will reach the campsite by evening. Overnight at Biskeri Thatch in tents. Imbibing the views from mountain tops. Keep trekking downhill and make your way to Barshaini village. Trekking through dense forests, you will pass through the twin villages of Pulga and Tulga before reaching Barshaini village. Here, you will board vehicles that will drive you down to Kasol. Your trip ends here. Arrive at the campsite in Kasol by morning. You will be accommodated in dome tents on a triple-sharing basis. Sleeping bags and mattresses will be provided for a restful night's sleep. Your campsite comes with a common kitchen/dining tents and toilet tents. Today's meals include lunch, evening snacks and dinner. Overnight at Grahan in tents. You will be accommodated in dome tents on a triple-sharing basis. Sleeping bags and mattresses will be provided for a restful night's sleep. Your campsite comes with a common kitchen/dining tents and toilet tents. Today's meals include breakfast, lunch, evening snacks and dinner. Camping in lush green meadows. Overnight at Min Thatch in tents. Overnight at Nagaru in tents. Overnight at Biskeri Thatch in tents. Evening views from the campsite. Today's meals include breakfast and lunch.